About "NIV Lifehacks Bible Turquoise (Black Letter Edition)"
A 'Lifehack' is any advice, shortcut, or tip that helps you get things done more efficiently and effectively. 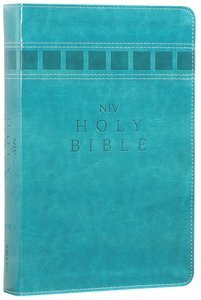 This NIV range does just that with God's Word, through 365 practical articles on disciplines like prayer, self-reflection, character formation, and fasting, as well as many other helps. A "Lifehack" describes any advice, shortcut, tip or skill that will help you get things done more efficiently and effectively. The NIV Lifehacks Bible uses "lifehacking" methods to give you practical and achievable tools to integrate spiritual habits into your busy, technology-centric, 21st century life. With 365 articles covering 30 life-changing disciplines, not only does this Bibleilluminate scriptural wisdom on spiritual practices, it provides practical tips and strategies for applying them every day. JOE CARTER(BA, Excelsior College) is the managing editor forCulture11, an online magazine. His personal blog, The Evangelical Outpost, was voted &#8220;Best Religious Blog&#8221; in the 2005 Weblog Awards and was named one of the &#8220;Best Spiritual Blogs&#8221; by Belief.net. Carter contributed to Crossway&#8217;sThe New Media Frontier.JOHN COLEMAN(Berry College) was named the nation&#8217;s top overall intercollegiate speech competitor in 2004. After working for two years at a top management consulting firm, Coleman is currently pursuing an MBA/MPA at the Harvard Business School and Harvard Kennedy School.